Falkensteiner Höhle („Falkenstein Cave“) is an active water cave through which the river Elsach flows. Upon heavy rain or snowmelt the water may rise within the cave to a level at which the water overflows the entrance, plunges down the rock barrier foaming in cascades. It may well happen that the path leading to the cave is being destroyed partially or washed away (Floodwater in January 2011, movie by J. Fodor). A flood this strong causes the low-ceilinged part of the entrance to be found completely under water for as long as over 20 meters. An inspection under these circumstances is only possible for the very experienced cave divers. With the weather being normal a visit of the cave is possible up to a distance of about 150 meters. Generally speaking, there should always be two high-quality separate lighting systems when going in, i.e. two powerful flashlights per person. Torches or oil lamps are forbidden due to cave protection. After the low-rise entrance part the path gets wider again and on the right side the second sink hole can be found, where the streamlet disappears at times of risen water levels and re-appears partially at the acclivity and the fountainhead. After a clayey passage you encounter the first sink hole which is always active as opposed to the first one. At times of a flood the absorbing capacity of the two sink holes is too low which causes the river Elsach to appear at the entrance of the cave again. Slippery rocks soon lead to the “Regentörle” (“Little Rain Door”), a spot where there is always water trickling off the ceiling even at a drought. Up to this point a walkthrough for the common tourist is possible without any problems. The further advance is more complicated due to partially chest high water levels and requires a wetsuit. Moreover, the light supply needs to be watertight and function over a long period of time. On top of this, a spare lighting is mandatory! 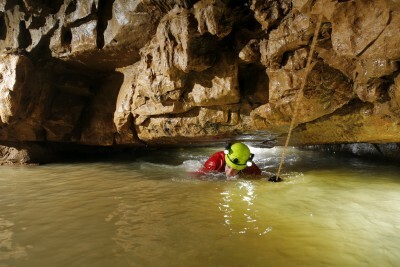 Being equipped this way it is possible to go into the cave as far as 480 meters at normal water levels. Then, you encounter the first siphon. The path is all the way spacious, ravine-like, traversed by partially over sintered lintels without any noteworthy side elements and drained by the Elsach river. 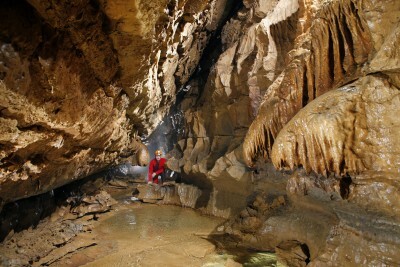 The first siphon of Falkensteiner Cave nowadays is only completely filled when the water level has risen, and there is usually an air gap of about 5 to 10 centimeters for breathing. A neoprene shell is strongly recommended. The path remains spacious after the first siphon and after a couple of meters you find yourself in front of a massive lintel building the arch of the “Reutlinger Halle” (“Hall of Reutlingen”). Here, you have to climb up some meters , cross the hall and descend to the brook bed again. Behind „Reutlinger Halle“ one of the prettiest parts of the cave begins, the so-called „Wasserfallstrecke“ (“Route of Waterfalls”). The path continues into the mountain remaining spacious all the way. Past sinter cascades and over little step like waterfalls you reach another area of lintels after about half a kilometre. The blocks here are covered with soft-soap-like, slippery and partially meters thick layer of clay (cob wall) which makes the progress difficult. Just before the “cob walls” you see the “Krokodil” (“Crocodile”), a meter long stalactite which has fallen off the ceiling and which represents the landmark at the end of the “Wasserfallstrecke”. At the end of the consistently dry clay path you reach a larger hall of lintels at the end of which a very narrow way through (“Fuchsbau” – “Fox’s Den”) leads down to the brook bed again. The distance to the entrance is now about 1200 meters and the following path shows a box-shaped profile: short and dry parts take turns with stretches forcing you to wade through knee-high or hip-high water. Shortly after the beginning of this part of the cave you need to pas the „Waschbrett“ (“Washboard”), a wide but low-rise gap only some centimetres above brook bed level. When the water level has risen a siphon jams which is a couple of meters long. After almost another kilometer there is yet another area of lintel and once you have squeezed yourself through the blocks you finally encounter the “Bänischhalle” (“Bänisch Hall”) with the second or “Großen Siphon” (“Big Siphon”). This one is a real siphon, which means there is no air gap allowing you to breathe. Right after the second siphon there is a third one (“Schiefer Siphon” – “Crooked Siphon”) and in the following passage there is an air gap of only a couple of centimetres depending on the water level between the ceiling of the cave and the water level. Consequently, this part is called “Letzte Ölung” (“Last Rites”)! The passage get larger again and past dripstone columns, sinter cascades and snow-white stalagtites you reach after another 600 meters the “Eiseleversturz” (“Eisele Collapse”), a relatively young boulder choke which blocked the corridor completely and built the end of the cave until New Year’s Eve of 1977, 2750 meters away from the entrance. The most beautiful part of the cave is the „Riffstrecke“ („Riff Passage“) which follows the Eiseleversturz. Neither another lintel nor any other major obstacle make the advance to the “Hohe Kluft” (“High Gap”) difficult at the bottom of which the cave submerges in another long siphon (“Tiefer Siphon” – “Deep Siphon”). This new part of the cave differs substantially from the ones we have already seen: The rock formation is massive limestone, a unstructured and partly sharp package of rock, totally different from the entrance-near areas in which bedded limestone prevails. Especially remarkable is that some stalactites are bluish which might be caused by a minor amount of copper in the rocks. Falkenstein Cave makes its way through the mountain in a relatively simple geographical way: A corridor showing a spacious profile which is mostly ravine-like or box-shaped and rarely elliptic without noteworthy side parts or even a labyrinth. The few side corridors do not even reach a length of 100 meters, are very narrow compared to the main entrance and have no water which means they have never played an important role as water supplier for a longer period of time. The main water supply is done by the “Tiefes Siphon”. Moreover, the cave does not have overlying floors. In the area of the “Bänischhalle” the cave underpasses Grabenstetten. 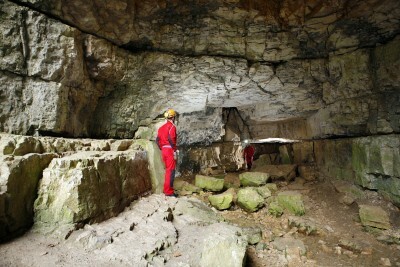 The overburden at the entrance is about 100 meters, towards the end of the cave it might be about 50 meters.